The first War Memorial was located in front of the old School, now a private residence in Top End, to commemorate those who died in the First World War. Until 1910, Renhold suffered badly from endemic typhoid; in that year Cecil Henry Polhill of Howbury Hall financed the piping of clean water from Biggleswade to Renhold and every house in the village was supplied with clean water. 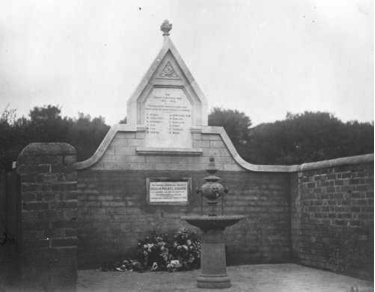 A fountain (above) was also then erected by C H Polhill. A commemorative stone (in the brickwork) was engraved and erected by grateful villagers. 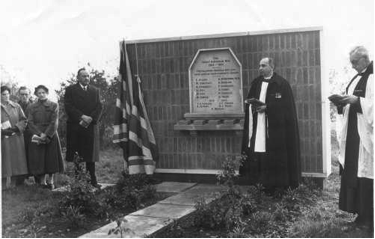 After the Second World War, Mrs Charles Polhill donated an area of land in Top End to the Parish Council as a new site for the marble tablet and having the benefit of a garden; the names of those who died during the Second World War were added. E ALLEN, Ernest John Allen, Gunner 25996 86th Heavy Bty, Royal Garrison Artillery died on Monday 5th February 1917 and whose death is recorded on Memorial. 14. Baghdad (North gate) War Cemetery, Iraq. Ernest was the son of John Allen and Mary Ann Seamer Constant (known as Pollie) who married in All Saints, Renhold on 25th September 1883. The family lived in a cottage at Tithe farm opposite the Church. W CONSTANT, William Blench Constant, Private 233489 1st/2nd Bn., London Regt (Royal Fusiliers) died on Monday 24th June 1918 aged 24 and was buried at Dainville British Cemetery, Pas de Calais, France. Grave Reference 1.F.15. N. In All Saints Churchyard there is a memorial gravestone (plot N27) which reads “In loving memory, of, Katie Naomi Constant, who died March 21st 1912, Aged 39 years, Also of Katie Constant, her beloved daughter, who died October 20th 1916, in her 14th year, Also of, William Blench Constant, who died on the battlefield, June 24th 1918, Aged 24 years” William, known as Callie, was the son of Katie Naomi Constant, sister of Mary Ann Constant, the mother of Ernest Allen, and William was born c. 1894 in Dalston, London. A COX, Arthur James Cox, Private 33027 6th Btn Leicestershire Regiment died on Saturday 28th April 1917 aged 31 and buried at Boyelles Communal Cemetery Extension, Pas de Calais, France, Grave Reference I. C. 6. Arthur was the son of Henry Cox, born in Renhold c.1856, and Elsie Cotchin, born in Great Barford in c.1855. Henry and Elsie married in All Saints Renhold in January 1881. About 1908 Arthur married Elizabeth Ann ? and they had four children. W CURTIS, Thomas Walter Curtis, Private 204477 1st Btn Hertfordshire Regiment died on Saturday 23rd March 1918 and was buried at Ste. Emilie Valley Cemetery, Villers-Faucon, Somme, France, Grave reference III. F. IS. Husband of Mrs L.E. Wootten (formerly Curtis), of 2 Farrar Street, Kempston. Thomas, known as Walter, was born in Renhold and the family lived in the house opposite the entrance to Becher Close. Walter was the son of Samuel and Ursula Curtis. They are buried in All Saints churchyard (plot L35). A DUNCOMBE MM, Alfred John Duncombe, Lance Corporal 33795 8th Bn. Bedfordshire Regiment died on Thursday 19th April 1917 aged 20 and whose death is recorded at Loos Memorial, Pas de Calais, France, Panel 41. Son of Mrs A F Duncombe of Howbury Cottages, Renhold. In All Saints Churchyard, there is a gravestone (plot K16), barely legible which reads “In Loving Memory of, …… and Anne Duncombe who passed on March 23rd 1933 aged 67 years, Also their son Alfred killed in action in France, April 19th 1917 aged 20” Alfred was the eldest child of five children of Amos and Anne Florence Duncombe. Amos was born c.1869 and died on 25th March 1906 and Anne was born c.1868, the daughter of Mr and Mrs Alfred Ashley of Pulloxhill; she died on 23rd May 1935. F HARRISON, Frederick Harrison, Private 77041 16th Bn Canadian Infantry (Manitoba Regt) died on Tuesday 13th June 1916 aged 35 and whose death is recorded on the Menin Memorial at Ypres, Ieper, West-Vlaanderen, Belgium, Panel 24-26-28-30. Frederick, the son of Samuel and Naomi Harrison, was born on 8th October 1881. The family lived at Hill Farm, Water End, Renhold. Samuel was born c.1849 and Naomi c.1850; they are buried in All Saints churchyard (plot L17). S KIRBY, Sidney Charles Kirby. Private 200728 1st/5th Bn. Bedfordshire Regiment died on Sunday 26th August 1917 and was buried at Gaza War Cemetery, Israel. Grave Reference XXII. A. 16. Sidney was the son of John Thomas Kirby and his wife Jane; John was called Thomas to differentiate him from his father who was also called John. They lived at 5 St Margaret’s Cottages in Renhold. H WARE, Herbert Ware, 13943 7th Bn. Bedfordshire Regiment died on Saturday 19th August 1916 aged 34 and was buried in All Saints Churchyard (plot M27). Husband of Elizabeth Agnes Lovell, then of Elm House, now 57 Top End, Renhold. The grave reads “Herbert Ware, (Beds Rgt), The beloved husband of Elizabeth Agnes Ware, who died August 19th 1916, of wounds received in France, Aged 34 years” Herbert was born in Devon – either Roborough, near Torrington or Doddiscombsleigh - in August/September 1883. For a time Herbert was a Police Officer in London but by 1907 had married Elizabeth Agnes Lovell, who lived with her parents at Salph End Farm. They had seven children. V B HARLOW, Presumed to be Victor Bernard Harlow, Guardsman 2620986 6th Bn. Grenadier Guards died on Sunday 17th October 1943 aged 23 and was buried at Minturno War Cemetery, Italy. Grave Reference VIII. E. 4. Son of Mr & Mrs S Harlow and husband of Joan Vera Harlow of Windsor. A LE FANU, Anthony Le Fanu of Woodfield Farm, Renhold, Serjeant 5952232 2nd Bn. Bedfordshire and Hertfordshire Regt. died on Friday 3rd March 1944 aged 25 and was buried at Cassino War Cemetery, Italy. Grave Reference XIX. B. 15. Son of Captain Hugh Barrington Le Fanu and Georgina Harriet Le Fanu, husband of Margaret Elizabeth Le Fanu, née Joyce, of Renhold. Anthony was the younger brother of Admiral of the Fleet, Sir Michael le Fanu. J E SWANN, John Ernest Swann, Private 14227002 5th Bn. Sherwood Foresters (Notts & Derby Regt.) died on Wednesday 15th November 1944 aged 30 and was buried at Cariano Ridge War Cemetery, Italy. Grave Reference XII. F. 2. Son of John James Swann and Florence Evelyn Swann of Renhold. M D WARD, Maurice Oliver Ward, Private 5951129 5th Bn. Suffolk Regt. died on Wednesday 29th September 1943 aged 27 and was buried at Chungkai War Cemetery, Thailand, Grave Reference 1. K. 8. Son of Benjamin and Gertrude Annie Ward of Renhold; they are buried in All Saints churchyard (plot I25) with reference to Maurice. P WATSON, Parkin Watson, Trooper 13095821 Royal Armoured Corps died on Sunday 30th July 1944 aged 23 and was buried in All Saints Churchyard (plot J37), son of Joseph William and Mary Watson. Husband of Eva Dorothy Constant of Renhold. The War Graves stone reads “13095821 Trooper P Watson, Royal Armoured Corps, 3rd July 1944 23” Below is a stone which reads “Joseph Watson, died 29th June 1972 aged 74 and Mary Lizzie died 29th June 1989 aged 92” – The parents are, however, buried in the old Bedford Cemetery.